A creditor is objecting to a personal insolvency arrangement (PIA) which would see a businessman and former racehorse owner write off more than €70m in debts, the High Court has heard. Property developer Conor Clarkson, of Cainfort, Enniskerry Road, Stepaside, Dublin, is seeking to have his PIA approved by the court. But financial fund Promontoria (Arrow) Ltd, which says it is owed €64m by the former Cheltenham Gold Cup winner, is objecting to his PIA, saying it is prejudiced by the arrangement. Mr Clarkson hit the headlines back in 2005 when his star horse Kicking King won the Cheltenham Gold Cup. The gelding amassed winnings of more than €900,000 during a successful National Hunt career. Speaking from his home last night, Mr Clarkson said that he did not wish to comment on the ongoing High Court case. If the PIA is approved, it will allow him to return to solvency. At a meeting earlier this year the PIA was approved by the majority of Mr Clarkson's creditors, which are mainly financial institutions. The debts are due to investments that Mr Clarkson made in property prior to the banking crisis and property crash of 2009-10. Included in the proposed PIA is a lump sum payment of €100,000, which has been available to the businessman's creditors. The money has been provided by a relative of Mr Clarkson. He will also retain his family home under the PIA. Mitchell O'Brien, Mr Clarkson's personal insolvency practitioner (PIP), says his debtors will do better through the PIA than if he is made a bankrupt. 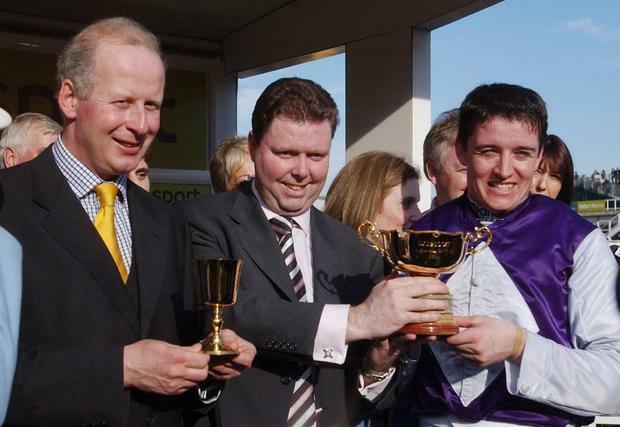 The lump sum would not be available if he was adjudicated a bankrupt, Mr O'Brien explained. Mr Clarkson has over the last number of years worked with his creditors and has implemented a sale strategy in relation to properties he had an interest in. The case was mentioned before Mr Justice Denis McDonald yesterday. Promontoria sought an extension of time so it can file its objection to Mr Clarkson's PIA being approved by the court. In a sworn statement, Promontoria said its objection was filed outside the permitted 14-day period because the person handling the case on its behalf mistakenly believed the fund had until March 1 last to file the objection. Eoin Martin BL, for Promontoria, said that the money owed by Mr Clarkson represented some 94pc of his total debts. The fund is his largest creditor and it was always their intention to file an objection. Promontoria had voted against the PIA at the meeting of Mr Clarkson's creditors. Keith Farry BL, for Mr Clarkson's PIP, said his side was not objecting to the extension, but the explanation as to why the objection was not filed in time was not satisfactory. The judge, noting the PIP's attitude towards the application, said he was prepared to grant the extension. But he added there was no automatic entitlement to it. He added he was not satisfied with the "broad brush" reason advanced by the fund in the sworn statement as to why the objection was not filed on time. The matter will be mentioned before the court later this year.